We’ve taken over 100 years of experience and the best of our top design features to produce this inspired model that delivers all you would expect from a quality Nilfisk appliance. Allergy rating – homes today have a high level of dust and airborne particles and allergies are becoming more and more prevalent. 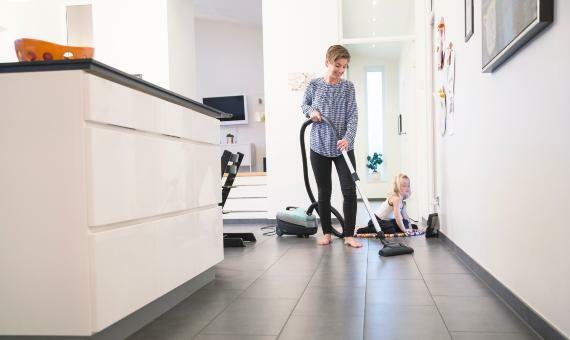 The Nilfisk Select reduces the dust levels in your home with an ‘A’ dust remission rating with the inclusion of an efficient HEPA 13 filter. HEPA 13 filters secure cleaning without dust particles re-entering your home. For an even greater level of protection the Nilfisk Select Allergy model is equipped with a HEPA 14 filter. HEPA 13 and 14 filters are able to pick up the microscopic particles and return the filtered air to the room even cleaner than the air was to begin with. Cleaning performance - dust pickup on carpet boasts a ‘C’ rating and on hard flooring an ‘A’ rating. This performance is achieved through optimization throughout the whole machine, without compromising on energy use and performance. Smaller for easy storage – we’ve made the Nilfisk Select small enough to store easily whilst still retaining all the latest features you would expect from a larger vacuum cleaner. A remote control handle with adjustable suction levels, and on/off functionality makes using the Select a breeze.